I wanted to share more of the Luxury wedding invitations Lela New York created for this bride's Hawaiian destination beach wedding. The couple wanted an elegant beach themed wedding invitation that would introduce their guests to their amazing venue, The Four Seasons Wailea, Maui. Lela New York created linen invitations which were adorned with beautiful custom crystal starfish closures and letterpressed in blush pinks and sage greens. I love that color combo! A heart felt thank you to all of you who supported Lela New York! We have won the people's choice award for Bride Pop's 2010 Best Wedding Invitations designer for New York!!!! Thank you for all the LELA LOVE! 1. What wedding services do you provide? I offer traditional makeup, airbrush makeup, brow shaping and eye lash extensions. Brides can also hire me for a one time application, half day where I follow them to the church and give them one more touch up before walking down the aisle, and full day where I stay with my bride until all her professional pictures are done including her cake cutting. It’s like having a personal makeup artist for the day. 2. What makes Brandy Gomez-Duplessis makeup artistry unique? (Smiling) I have been told by my past brides, who I have become close to, the same thing of what makes me unique. I calm them and make them all feel very special. To have a celebrity makeup artist on their wedding day to give them a glamxurious look, is amazing. Plus, I personally noticed that most of my brides are girly like me (laughing). 3. Could you please explain your process? I’m an energy person and an artist so I get to know my brides first. I look at pictures of them, their dresses, their flowers, their bridesmaid’s dresses. I talk about how they will wear their hair, what time of day they are getting married, where they are getting married. I ask questions about their skin which is very important and then I find out how they have always dreamed about looking. After all that, I prep the clients face based on their skin type and I start the makeup application. At the end, I apply everything on a face chart because a lot of time brides book my makeup services a year in advance, that way I don’t forget what was applied. So on the day of the wedding, I have the brides colors packed in ready for when I arrive. 4. What can you advice brides and couples to be aware of or avoid when hiring their makeup artist? I always share with my brides to definitely communicate with the makeup artist. Brides should have a consultation so both parties will be on the same page. Bring pictures on the consultation of themselves with makeup on, and of what look they have in mind. With many trends out, they will all not work on everyone. Smokey eyes cannot be worn the same way, so this is why a consultation is needed. If a bride is going to tan or has any skin problems, it can be discussed at the consultation. This can affect the makeup on the wedding day. I understand we are still in a recession, but you do get what you pay for. Also to be safe you should have your makeup artist fill out a contract to lock in your wedding date and time to ensure no double booking. 5. Can you work with all skin types? Including Sensitive skin? Yes, I have been blessed that my talent has allowed me to work with all ages, all races and all skin types. As long as my client communicates any issues she has like sensitive skin, than I am able to adjust. 6. What are the latest trends in make up? I try not to follow any makeup trends because the client may not be able to wear what’s trendy. That trendy looks does not always work for the everyday average women. I like to select colors and items that will compliment my bride. A bride that’s 25 cannot wear the same amount of colors a bride that is 50 getting married for the second time. I do find that my modern brides like bolder eye shadow colors and lipstick colors. One trend I can say that will always be around is lashes; strip lashes and individual lashes. 7. What was your favorite celebrity to work with? My favorite celebrity that I applied makeup on has been Kim Kardashian. Kim has amazing skin and she can wear any makeup look you put on her. Plus she’s a girly girl. She loves being pampered and loves makeup just as much as I do (laughing). When I do makeup on a client that is very receptive about getting their makeup done by me, it makes my job fun. 8. What musts should a bride have for her wedding makeup? Any tips? Brides should make sure that their makeup artist apply waterproof mascara for when they cry during their vows, loose powder to set their foundation, and use a cream eyeliner so their eyeliner does not smear or smudge when they perspire. Thanks Brandy for the great tips!!! Your Very Own Personalized Tea Party Bridal Shower! How great would it be to have a tea party for your bridal shower! Well I thought so too. So here is some inspiration and NYC bridal shower venues that I found to have a unique bridal shower tea party. At Lady Mendl's Tea Salon located at The Inn at Irving Place, your guest's can enjoy a 5 course tea surrounded by beautiful Victorian architecture. LOVE the pink room! I also love Alice's Tea Cup. They have 3 locations in Manhattan. I love the whole Alice and Wonderland theme for a bridal shower, so fun! And once you pick your location, you can then have cute tea favors! 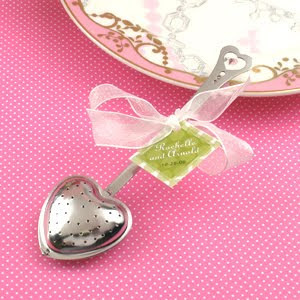 Adorable heart-shaped tea infuser with a personalized tag and ribbon to make your guests' tea experience effortless! 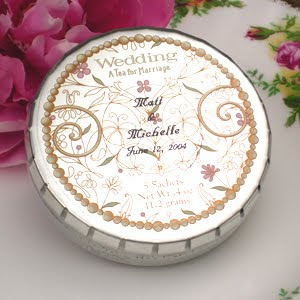 Cute tea tins that are filled with Mutan white tea silks that represent the bloom of new beginning of marriage. States in gold, "A Tea for Marriage". Exclusively made for your wedding day! Favors by New York's Favors and Flowers. Let me know your bridal shower ideas! Comment below. Calling all brides! The talented Tonhya Kae, a Seattle based photographer, is giving her first ever Wedding Photography giveaway contest! And the wedding can be anywhere. Tell her your true love story and you may be the lucky winner! For more information please visit The Tonhya Kae Website. VOTE for Lela New York's Wedding Invitations - we NEED you! Please VOTE for Lela New York as best NY Wedding Invitation designer. Ok, when I saw these I just died! They are the cutest most fashionable, itty, bitty jewelry I have ever seen! I think it would be the cutest bridesmaid's gift, ever! It would be a perfect thank you for being part of your wedding day. And what girl doesn't like jewelry? I HEART this cute love bird ring! And then you can buy the matching earrings! How cute are they?! And this bow shaped necklace is to die for. All of Joanna's work begins with sketches and then are rendered into metal by hand. You can see more of Joanna Rutter's beautiful work on her Etsy shop. Join the Lovely Wedding Salon in the West Village to celebrate summer and view their new bridal collection by Carol Hannah. Enjoy the Wedding Dresses and ice cream! Hello all! I wanted to share this beautiful wedding that was photographed by Diana Rothery Photography. It simply a beautifully romantic wedding! The couple, Kristen and Matt got married this past July in Connecticut at a beach gazebo on the Long Island Sound. The bride's gift to her bridesmaids were these beautiful matching hair barrettes. Wedding favors for guests were little flowerpots with various plants/flowers and herbs. Bridesmaid dresses were JCrew. After the ceremony the newly married couple took a horse-drawn carriage back to her parents' home, which is where the reception was held. This is one of my favorite luxury wedding invitations that we, at Lela New York have created! I know, I say that a lot, but this wedding invitation really is beautiful! This invitation was created for a destination wedding in Capri, Italy and was inspired by the brides wedding lace wedding gown and purple and lavender details. The silk invitation is a gatefold style and opens in the middle revealing the ultra thick letterpress and foil stamped invitation. The two pockets on each side of the gatefold/book style invite holds the bride's rsvp and reception cards. The inside of this luxury invite is also layered with a pretty lace that gives it such a elegant look and reflects the bride's style and wedding. The custom invitation design and graphics were inspired by their exquisite location and was hand drawn and later letterpressed. And the invitation was finished of with a silver satin ribbon and custom crystal closure.